The question people sometimes ask is "How did you know you were going to be successful as a game store owner?" You might be surprised to learn it was fairly recent. 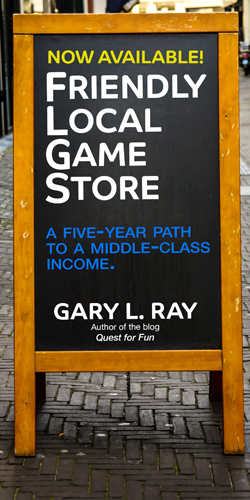 I spent far too much money building my stores, and it wasn't clear if these sunk costs would ever pay off. You can easily overbuild a business with no financial benefit and a really, really, long return on investment (ROI). I still wince when I think of the startup losses for the first year, and what I could do with that money if I hadn't been paying to learn retail. I could start a store now for a lot less, that's for sure. I took no significant profits from the business for the first five years. We moved to a bigger location, with stratospheric costs, after three years, expanding with loans and the like, so eventual profitability was in doubt. That's right, after five years, which included writing my blog for the last two, I wasn't entirely certain this whole thing wasn't a boondoggle. When the profits finally did arrive, what did I do? I expanded again. Too much money leads to risk taking. During the early years, I started doling out ever increasing distributions in the $1,2000-$2,000 a year range, as a kind of success place holder. Maybe if I faked profitability for long enough, it would actually happen. It's kind of like budgeting for your salary, even if you know you can't pay it in the beginning. Getting up to speed on profitability was critical, because my financial life had a five year period where I had an artificially low mortgage, and at year six, I needed to make nearly double my salary. My mortgage was set at fives years of "interest only," something banks don't do anymore. Year six was a wildcard. So for five years, I felt like we had overbuilt. It was like we were waiting for demand to catch up with the supply we were providing. We were overstaffed, over-inventoried, and growth was slowly putting wind in our sails. I say slowly but it wasn't uncommon to have 10-20% growth a year during these early days, but with corresponding infrastructure and staffing headaches to manage it. We talked a lot about gross sales, but I carefully avoided the "n" word. By the end of the fifth year, profitability started to climb. It appeared to be enough to guarantee I wouldn't lose my house solely because I couldn't make the payments. Was it a blip on the radar? Maybe, but my trend lines in Excel told me we were onto something. Just sit back for a moment and think about that. After five years of my life, maybe I wouldn't go broke. How is that rational? Who does that? If you think I'm bragging, let the stupidity of these statements sink in. 2013 was year six in business and I had enough steady profits to know I was doing the thing. I was making a steady middle class income, enough for the Bay Area even, but still not quite as much as when I worked in IT, nine years previous. Even with painful construction loans taking a big cut of profits, I still managed to maintain profits and my extravagant rise to the middle. Although the trade is constantly changing, I'm fairly confident I can weather most storms and continue running a store in some fashion. I say in some fashion because I've gotten a lot older over the past 14 years and I need to consider retirement options, which might mean a second business, getting another job, or reducing my costs, like living someplace cheaper while running the store remotely. It's either that or keep doing this thing for the next twenty years or so. If I had been working in IT over these game store years, I would have a million dollars in the bank easy, just in salary differences. Instead I have an economic engine that doesn't always need me, but it's a volatile engine running on moonshine and false promises. If you can't decide which is better, let me suggest you take the million dollars.